“Slow is smooth and smooth is fast.” I heard this quote recently from a Jeff Bezos interview as a philosophy he adopted in business. I heard it years ago when I was training one season for cyclocross with learning the varied terrains and strategies for turns (cornering) in this cycling sport. And I think it holds true for faith as well. I have slowly been reading my bible, an everyday habit. The daily practice IS smooth and easy. And all of a sudden, like there was some speed of movement, I have completed the tissue-thin study bible. 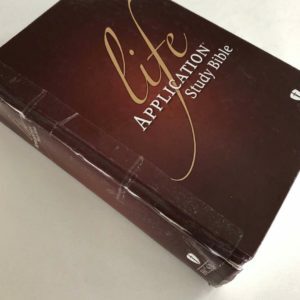 This week I finished reading the full Life Applications study Bible for the first time – every introduction, profile, footnote, theme, etc. Yes, slow is smooth and smooth is fast. The study bible read is pictured. The spine binder tore from use and I was proud of this side effect, using packing tape to mend. 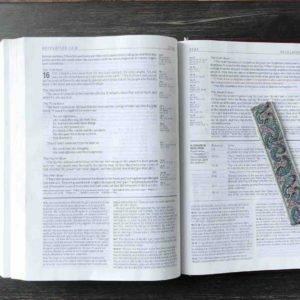 The bookmark keeping my place was from my Sweet Jean’s Bible so she was with me all the way. The tissue thin pages of small font adds up. Little by little. Slow IS fast. In our daily pursuit of speed, do you know how long it has taken me to read this study bible? Over 2 years. 992 Days. I started Jan 22,2016, to be exact. 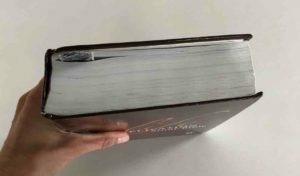 Every day I usually read one chapter, sometimes half if it was long, along with the corresponding footnotes of interpretation for greater understanding, profiles and introductions. At times I read more in the evening. I wasn’t in a race. For me, it wasn’t about speed. It was about my faith, developing a relationship OF faith and WITH faith. And I soaked it in like the roots of a hungry tree. LiveBreatheAlive.com – Designed to encourage others to seek and see the cross in everyday life. I love that it wasn’t a race. It is a journey as deep as life itself was meant to be. God made us to soak it all in at our pace and understanding. Praise God that he knows us so well and gives us heaven on earth. Thank you Karen! Yes, I was blessed all the way!